5 1/4" closed linerlock. 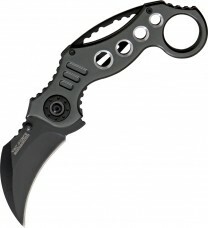 2 7/8" black coated stainless assisted opening curved design blade with dual thumb studs and extended tang. Dark gray anodized aluminum handles with drilled hole design, thumb ridge, enlarged finger ring and open designed spine. Black stainless pocket clip with slot cutout design.